If you are taking your dogs out for a walk at night, you do not have to worry about losing track of them anymore. All you need is to put the LED collar around their neck and switch on the LED lights. With their powerful light properties, LEDs will enable you to see the pets wherever they are no matter how dark the night is. You no longer have to keep holding your dog next to you for fear of losing it. Just keep your eyes on the LED light and give the dog the freedom it deserves to roam around. Most of the dogs usually die from the cars and bike accidents, particularly when taken out for a walk. Due to their playful nature ad curiosity, dogs are highly prone such accidents especially at night or when there are low light situations. If you are walking your dog at night along the streets, it might cross the road without your knowledge. We know that they often run onto the road blindly. What if there was an oncoming speeding car or bike? The accident might occur, and you can lose the pet, or it gets severely injured. With LED lighted dog collars, the driver or the rider can see the moving LED lights and thus slow down to let the dog pass. This will prevent any fatal accident from happening. If you are out in the park or your home compound at night, it is very easy to lose track of your dog unless you keep it close to you. But with the LED light, you have the solution to all these. By just putting on the collar, it allows you to keep track of your dog. You can see it from several feet away due to the LED’s superior visibility at night and low-light situations. The collar allows your pet to roam around the park or the compound freely without fear of it getting lost in the dark. It is important to note that the LED can discourage thieves from stealing your dog at night. 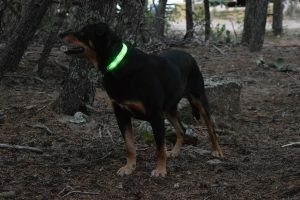 These are some of the main safety benefits of using LED dog collars. But you must ensure that you have gotten top quality collars to enjoy such safety benefits. Go for the brands such as Yippr LED dog collars that are receiving positive reviews from the customers. With features, such weatherproof, extended battery lifespan, quick rechargeable time and superior visibility at night, this LED dog collar is what your dog needs to keep it safe. Some people that have a favorite leather dog collar can also stay safe. Yippr has also has an LED Dog Leash that can be used to provide visibility for you and your pet. These leashes are very popular and can be seen by motorists from a long distance. Available in several colors you are sure to find the right leash that will compliment your pet.